Warp, weft, needle and strand star in an ensemble cast. A deconstructed drama unfolds through an impeccably crafted plot, featuring this season’s trousseau in an unconventional character sketch. Hand-cut leatherette sequin jacket, leatherette dress, both by Rimzim Dadu, Noida. Benarasi sari, by Ritu Kumar; ruby, gold and diamond necklace, from The House of Rose; antique gold earrings, ruby and gold bracelet, both from Zoya. All in Mumbai. 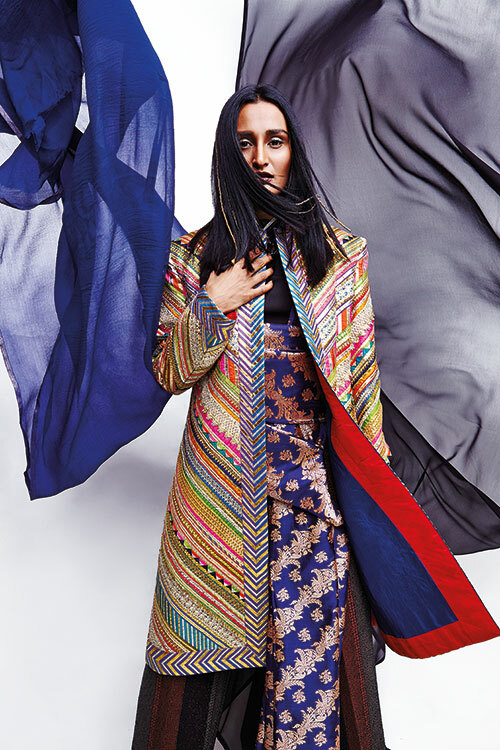 Asymmetric jacket-top, by Gaurav Gupta; thread-scallop textured jacket, flared trousers, both by Pankaj and Nidhi. Both in New Delhi. Embellished shawl with fringe, by Shahab Durazi; diamond and gold cuff, from Zoya; diamond and emerald earrings, diamond and emerald ring, both from The House of Rose. All in Mumbai. Heels, model’s own. Polo neck tank, by Dev R Nil, Kolkata. 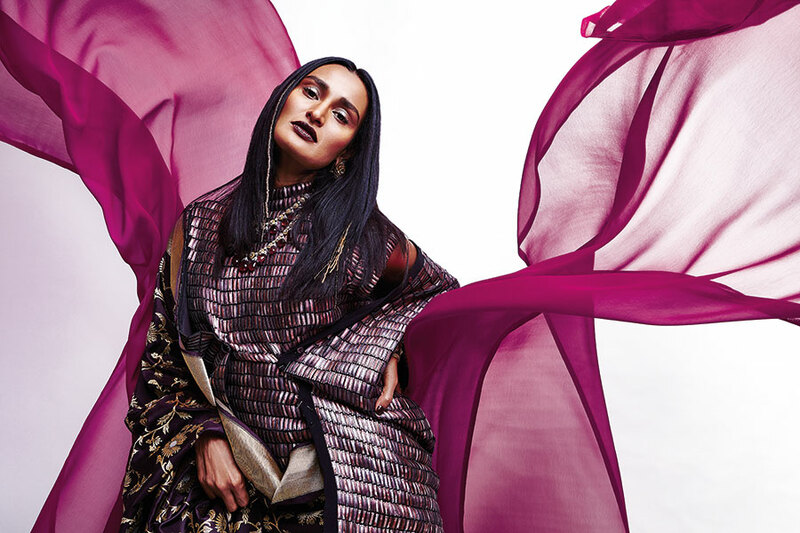 Zari ribbon embroidered bandhgala jacket, by Abu Jani and Sandeep Khosla; Benarasi sari, by Ritu Kumar; beaded twill trousers, by Shahab Durazi; jade and gold pendant, jade and gold earrings, both from Zoya. All in Mumbai. Brocade-draped wrap skirt, by Tarun Tahiliani, New Delhi. Benarasi sari, by Swati and Sunaina, Kolkata. Gota embroidered blouse, by Anita Dongre; antique gold necklaces, earrings, cuff, all from Zoya. Both in Mumbai. 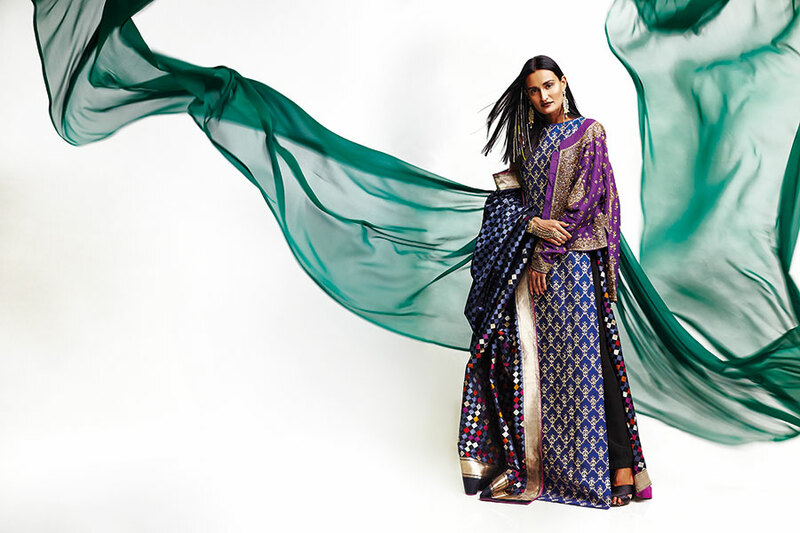 Jacquard sari, by Ekaya, New Delhi. Silk underskirt, by Dev R Nil, Kolkata. 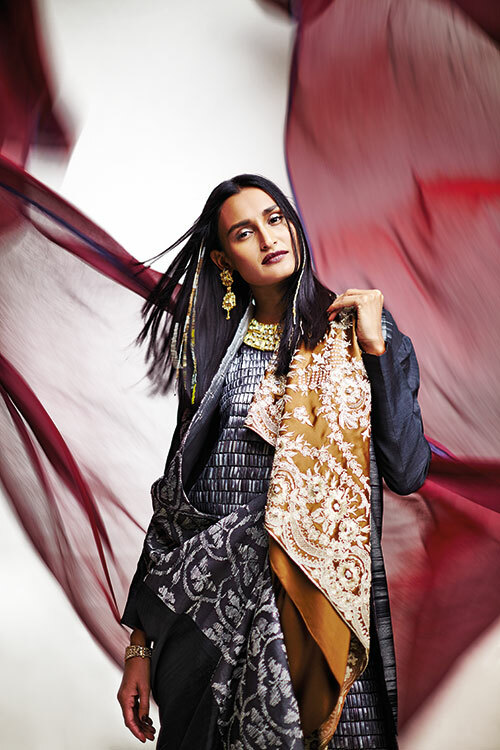 Zardozi cropped jacket, by Ritu Kumar; gota embroidered floor-length tunic, by Anita Dongre; gold and pearl earrings, haathphool, both from The House of Rose. All in Mumbai. Heels, model’s own. Hand-cut leatherette sequin top, by Rimzim Dadu, Noida. Embroidered ikat jacket, by Dev R Nil, Kolkata. Embellished satin sari, by Shahab Durazi; jadau necklace, jadau earrings, polki bracelet, all from The House of Rose. Both in Mumbai. 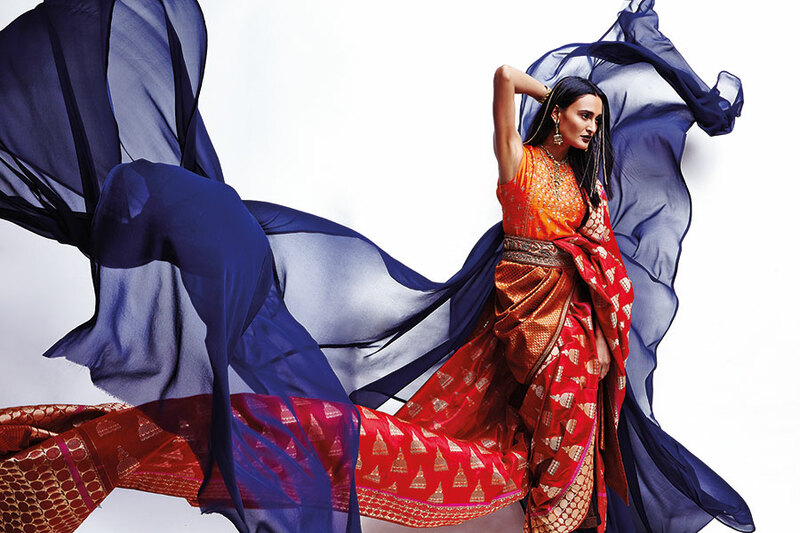 Gara embroidered sari, by Ashdeen, New Delhi. Pearl-embellished gown, beaded chiffon shirt, both by Shahab Durazi; ruby, topaz and diamond earrings, ruby and diamond ring, both from The House of Rose. Both in Mumbai.